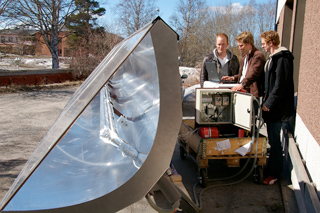 Test of a solar collector in the Spring of 2006 with Graduate Students Emil Larsson, Chalmers, and Magnus Kllmark, KTH. There are many advantages with concentrating sunlight, foremost the possibility of producing both electricity and heat at the same time and with the same system. Electricity and Heat from the Same System! The heart of a concentrating solar collector is the receiver, where sunlight is concentrated. Together with the water-cooled solar cells, sunlight is converted to electricity and heat. 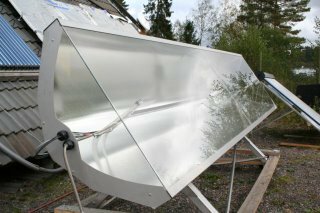 Sweden has a long tradition of working with concentrating solar energy systems, but 30 years of solar energy research has produced few businesses. The missing link has been research and testing in order to solve concrete problems together with businesses. In addition - for concentrating solar energy - some strategically important measurement equipment is lacking in Sweden. The Lumicum Laboratory would like to act as a catalyst, commercialising concentrating systems and putting Sweden in the lead. generate both 230 V electricity and 55º hot water. Hot water can be used for, among other things, bath water, desalination, solar cooling och process heating.